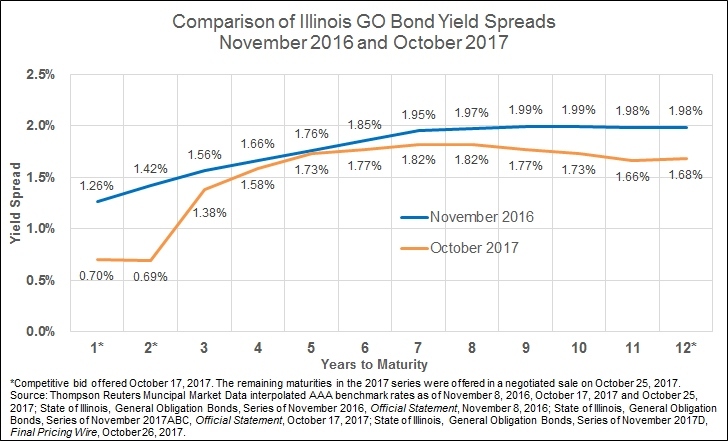 Illinois completed the sale of $6 billion in General Obligation bonds on October 25 with a negotiated sale of $4.5 billion following the competitive sale of $1.5 billion on October 17. The bonds were authorized by the Illinois General Assembly as part of its FY2018 budget package for the purpose of repaying a portion of the State’s bill backlog, which stood at $16.4 billion as of October 25. Despite a downgrade by each of the three credit ratings companies since the State’s last GO issuance in November 2016, continued uncertainty about the State’s FY2018 budget balance and a drop in the bond market in the days before the October 25 issuance, the spreads between the bond yields and market benchmark rates were significantly lower for the new issuances than they were a year ago. The following chart compares spreads for the two series. The lower spreads are due in part to renewed investor confidence since Illinois passed its first budget in two years over Governor Bruce Rauner’s veto. However, investors were also attracted by high yields in a low yield environment and high liquidity due to the large size of the issuance. Credit rating companies saw the issuance as a credit positive because the proceeds will be used to repay backlogged bills bearing interest rates between 9% and 12%. The sale of the backlog bonds is scheduled to close on November 8. Because the majority of the bonds sold at a premium, the Comptroller will be able to apply nearly $6.5 billion of proceeds toward the repayment of outstanding vouchers. In its economic and fiscal policy report, the Governor’s Office of Management and Budget had estimated only $6.0 billion of proceeds for backlog reduction. Of that amount, about $3 billion of the bond proceeds was planned to be used to pay group health insurance bills and the remaining $3 billion to pay Medicaid bills and other overdue bills that accrue interest penalties. Use of the bond proceeds to pay Medicaid bills was expected to generate federal reimbursements of $1.1 billion. The economic and fiscal policy report estimated that the borrowing and other measures would bring the total backlog down to $7.5 billion by the end of FY2018. Even with the additional proceeds from the bond sale, the end-of-year backlog amount remains uncertain because it depends on the outcome of the FY2018 budget. Because of this uncertainty, GOMB is not currently revising its estimate of the FY2018 ending backlog due to the bond sale. The improved market performance of Illinois may also assist other public issuers in the State that suffered from increased borrowing costs during the budget impasse. The Chicago Board of Education plans to issue over $900 million in November, of which $440 million will refund variable rate bonds that have gone to the maximum statutory rate of 9.0% due to the expiration of liquidity agreements with banks. Approximately $190 million will refund outstanding fixed rate debt and $290 million will go to capital projects. The City of Chicago plans to issue up to $3 billion to refund existing General Obligation and sales tax-backed bonds through a new special purpose entity. The new entity is a lockbox designed to intercept sales tax revenue in order protect bondholders in the event of a bankruptcy, which is not currently allowed under Illinois statute. However, since sales taxes are collected and distributed by the State the new entity may still be affected by investor perceptions of Illinois. Nevertheless, the City hopes to save up to two percentage points on debt service by receiving better ratings than its GO bonds, which are currently rated BBB+ by S&P and Kroll; BBB- by Fitch; and Ba1 (non-investment grade) by Moody’s. Finally, the State will return to the market later this year to borrow $750 million for capital projects. That issuance will demonstrate whether strong investor appetite for Illinois debt will continue.